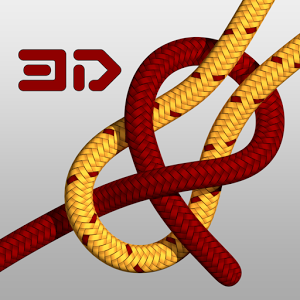 Used by arborists, fishermen, firefighters, climbers, military and boy scouts the world over, Knots 3D will quickly teach you how to tie even the most difficult knot. With more than 120 knots, Knots 3D will be your go-to reference! Grab some rope and have fun! •Featured as a top outdoor and boating app by: GQ Magazine, Boating Magazine, Outside Magazine, Cruising World, and Sailing Magazine among others. •121 unique knots with new ones added frequently. •Browse by category or search by name, common synonym or ABOK #. •Supports landscape and portrait modes as well as fullscreen (Zoom in on a knot to see greater detail). •Watch knots tie themselves and pause or adjust the speed of the animation at any time . •Rotate knots in 360 degree, 3D views to study them from any angle with a swipe of a finger. •Interact with the knot on screen via mult-touch gestures such as pinch-to-zoom and swipe to tie/untie. •Completely advertisement free and no in-app purchases.